As I sat at my desk, wearing my fuzzy Ugg slippers, with a big mug of chamomile and an even bigger packet of derivations and proofs, all I could think about is how badly I want to be in the kitchen. I wanted to feel the warmth of the oven on my face, and pound out my frustrations in butter and sugar. I hardly recognized my yoga pants without two big hand-prints of flour on them, and my camera looked so unfamiliar without any big, buttery thumbprints. All I wanted to do is bake something. So, being the savvy procrastinator that I am, I came up with an excuse why I had to get my hands on my Kitchen Aid. Maybe this granola will knock those facts about the Hundred Years War out of me! Maybe this will power me through that last derivation! Done. This granola had to be made. ASAP. So now on to the granola. I bet that we can all agree that the best part of Honey Bunches of Oats are the “honey bunches” — or the little granola clusters. 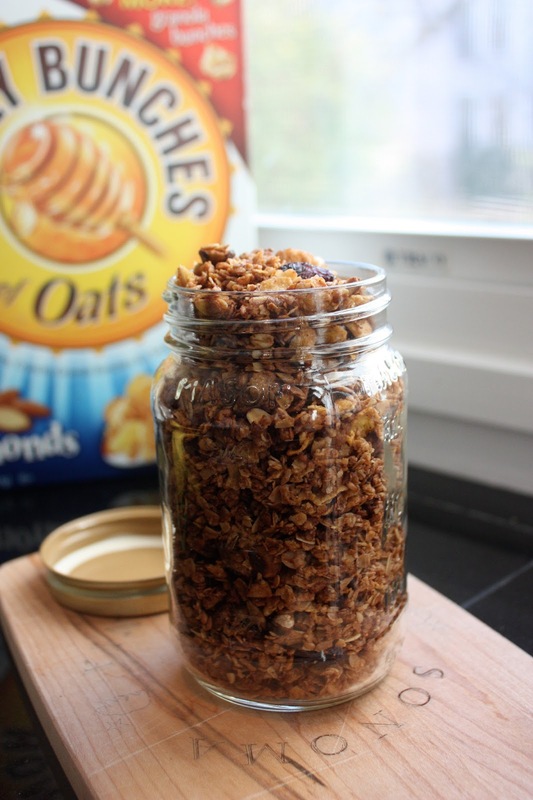 The recipe that I’m about to share with you all is pure magic, because it turns regular Honey Bunches of Oats into pure granola! Since I’ve been obsessed with brown butter lately, I browned the butter in this recipe. Brown butter really takes the ordinary to the extraordinary. What do you like to eat when you have a big test? until golden brown (do not overcook), stirring occasionally. Remove from oven and let it cool completely before storing in an air tight container.